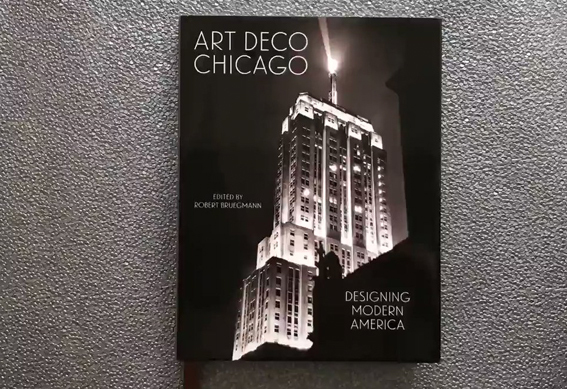 We are proud to congratulate Associate Professor Robert Blandford for his role as Executive Editor of Art Deco Chicago, a new book that provides an expansive take on American Art Deco and explores Chicago’s pivotal role in developing the architecture, graphic design, and product design that came to define middle-class style in the 20th century. Frank Lloyd Wright’s lost Midway Gardens, the iconic Sunbeam Mixmaster, and Marshall Field’s famed window displays: despite the differences in scale and medium, each belongs to the broad current of an Art Deco style that developed in Chicago in the first half of the 20th century. This ambitious overview of the city’s architectural, product, industrial, and graphic design between 1910 and 1950 offers a fresh perspective on a style that would come to represent the dominant mode of modernism for the American middle class. Lavishly illustrated with more than 300 images, the book narrates Art Deco’s evolution in 101 key works, carefully curated and chronologically organized to tell the story of not just a style but a set of sensibilities. Critical essays from leading figures in the field discuss the ways in which Art Deco created an entire visual universe that extended to architecture, advertising, household objects, clothing, and even food design. Through this comprehensive approach to one of the 20th century’s most pervasive modes of expression in America, Art Deco Chicago provides an essential overview of both this influential style and the metropolis that came to embody it.